This summer we drove the farthest we have ever gone with the girls. Our vacation was in Williamsburg, VA which is 14 hours from St. Louis, MO. We decided to stop overnight both ways to break up the trip. I knew the girls would be watching several movies on this long trip but I wanted to have some fun breaks from the DVD player. 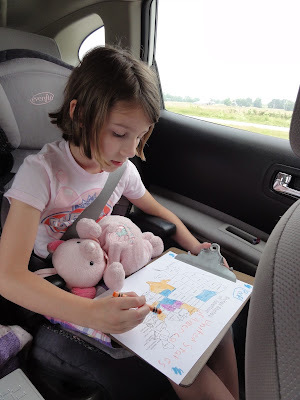 I looked around for some fun ideas to keep the girls busy for the long trip there and back. First to combat the dreaded, "are we there yet" question I made a map charting our way there. We had a little monkey pin that the girls got to take turns moving along the route. It helped us all know just where we were and how far we had to go, so that question was never asked. On our last car trip we played the licence plate game with a scratch piece of paper making a list. This time I printed out a map for each girls to color in or cross off as we saw the licence plates. I really liked this because it also helps with learning all the states. I also a bought a few new coloring books to help keep them busy and the snack box was also a big hit. Overall our trip there and back went very well with the girls. Brian and I now know we can all survive the super long car trip. The question now is... where to go next year?